With less than a month to go until Christmas, we’ve rounded up some of our favourite products that we think would fit beautifully under Christmas trees around the world. Every Dunmore Scotland piece is designed and made in Scotland using locally sourced materials wherever possible. Classic textiles married with modern design for timelessly elegant and classic pieces. Delivery to UK addresses is free with an express DHL courier service (charge) for our overseas customers. 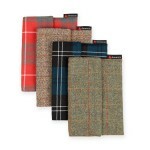 A tartan or Harris Tweed iPad cover (£38) – choose from 3 tartans or 2 Harris Tweed options. Fleece-lined to keep your device safe and scratch-free. 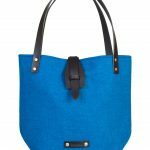 Classic Ailsa tote (£45) – a classic shoulder tote in two choices of ‘classic’ Harris Tweed weaves. 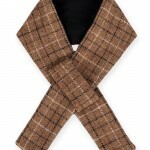 Short Harris Tweed scarf (£45) – designed to fit snugly under a coat or jacket, this is available in two colours. 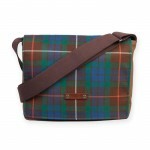 The zipped toilet bag (£34) – waterproofed lining inside either a Harris Tweed or tartan outer. 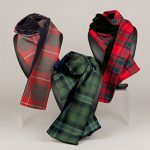 A cosy tartan scarf (£69) – a variety of tartans to choose from with either fleece, velvet or silk lining. Super-cosy for cold winter days or nights. 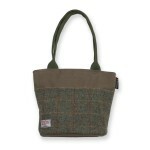 The Ettrick Tote (£85) – a large soft shoulder bag that comes in a range of Harris Tweeds and tartans. 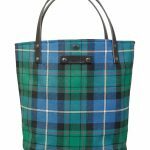 The Ailsa bucket tote (£95) – our most popular mid-sized bag, available in a choice of tartans or Harris Tweeds. Leather handles add a touch of luxury. 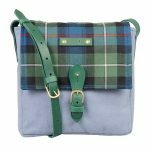 The Orkney satchel (£139) – a stunning bag that features modern and bright Harris Tweeds and tartans on wool bodies. 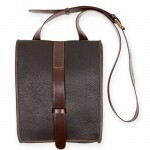 An adjustable leather shoulder strap enables it to be worn cross-body or on the shoulder. The Skye satchel (£139) – a large satchel designed for work or play. Designed to hold a 15” laptop or A4 folders. 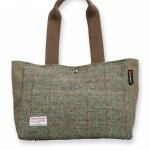 The Shetland tote (£149) – our largest Harris Tweed tote. 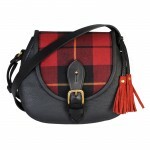 Bigger than the Ailsa, the leather straps are long enough to be carried over the shoulder. Bright jewel-like colours sit alongside traditional patterns. The Strathearn saddlebag (£295) – our signature leather saddle bag, available in a range of leathers, tartans and Harris Tweeds. 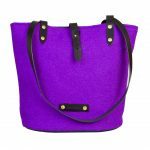 Lined in luxurious soft suede, the saddlebag can be worn cross-body or over the shoulder. The Elgin satchel (£295) – perfect for travel, this elegant unisex leather satchel is lined in soft suede. 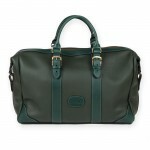 Available in forest green or dark brown leather. 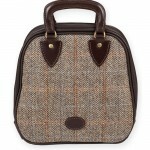 The Alford handbag (£275) – a stylish handbag available in Harris Tweed, a choice of leather and a wool fabric. A spacious roomy bag for everyday use. The Arisaig weekend bag (prices from £475) – the largest piece in our collections, the Arisaig weekend bag is perfect for a business trip or a fun weekend away. 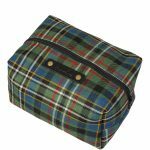 Choose from tartan, leather or wool options. We’ve spotted an Oscar-winner with one of these!